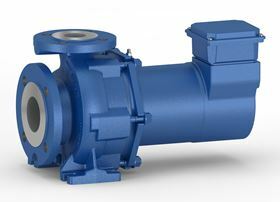 International pump manufacturer, KSB, has expanded its Etaseco RVP type series pumps, adding the capability to cool power electronics on trains and wind turbines. With modern wind power stations and electrically driven trains becoming more and more powerful, the integrated liquid-cooled power converters need to be able to dissipate more heat. The Etaseco RVP pumps are zero-leakage canned motor pumps, usually employed in cooling systems, where they circulate a water/glycol mixture at a discharge pressure of up to 6 bar. They are designed for an operating pressure of 10 or 16 bar. With their optimised hydraulic system, they can handle larger flow rates per size than conventional industrial pumps. The maximum flow rate for the 50 Hz version equals 44 m3 per hour; the maximum motor rating equals 3.4 kW. The coolant temperature can range from -50 °C to +110 °C, depending on the climatic conditions. More than 100,000 Etaseco pumps for use in trains and wind turbines have been sold worldwide. One of the keys to this pump series’ success is its high MTBF that exceeds 1,300,000 hours.